Chester in the recovery room, always ready for some loving. 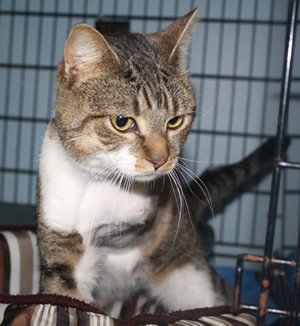 Chester was approximately 8 to 10 months old when he came to live at the Halfway Home Pet Rescue in Caribou. He was found on the side of the road between Lyndon St and Sleeper’s Store. Chester was not able to walk because of a very damaged left front leg. The man who found him brought Chester to his apartment and called HHPR. We immediately took Chester to the vet where X-rays revealed that the leg was so badly damaged from an old and terribly infected bite wounds that it could not be saved. Two days after the amputation, Chester was out and running around. We had to take turns restraining him to a cage so that he would not over do his activity. Rest was a medical priority for him. But Chester rebelled and soon all efforts to cage him ceased. Chester ran up and down the stairs at his foster home, climbed to the highest spot on the cats’ castle and jumped up and off stairs. Chester considers himself to be a hunk and although he hasn’t actually fought with any other shelter cat, he does a great job of hissing and spitting – especially at other male cats. The sound of a can of food being opened brings him at a full gallop to be first at the dinner plates. 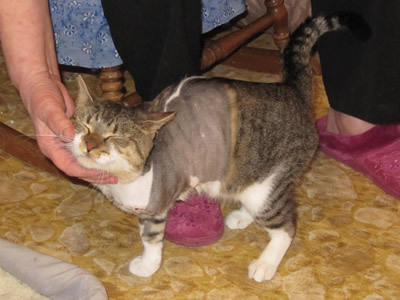 Chester’s healing continued smoothly and by the time his hair grew back over the surgical wound, he was acting like any other young, curious, playful young cat. He has no trouble running and climbing the cat tree in his foster home. When kittens are around, Chester is right there ready to play with them. Chester is now in his forever home. He’s very active and gets along with the family dog and his friend, Mr. Paws.